In Maribojoc, some 14 km west of Tagbilaran City, a curious triangular watch tower oversees the seas South of Bohol. From its windows at the top, you can see Cebu, Siquijor, and Mindanao. The Spanish had it build in 1796 as a look-out post against pirates and Muslim marauders, who at that time where a plague to the people of Bohol. Remants of similar triangular towers can be found in a number of other places along the coast of Bohol, such as Panglao, Dauis, Loay, and on Pamilacan island, but this tower is the most intact. 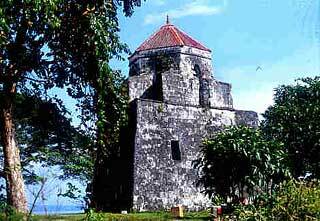 The tower of Loay, about 18 km east of Tagbilaran is much eroded by the waves of the sea. The tower on Pamilacan island was build to a slightly different plan. Today the Punta Cruz watch tower still provides an excellent view. The site now offers a small stall for buying drinks and snacks and makes a good spot for a picnic and a swim -- although you'll have to watch out when you climb on the very sharp rocks. Getting there. Catch a bus at the Tagbilaran Integrated Bus Terminal in Dao. Most buses going in to Tubigon will pass along Punta Cruz. Ask the driver to drop you off at Punta Cruz, and walk down for about 500 meters to the watch tower. Punta Cruz Watch Tower is an awesome place to be with, the view and the atmosphere of the place is so relaxing. So, Upon visiting that place, you may feel you want to have a souvenirs for your love ones waiting for your homecoming from vacation and some stuff you may want to give them so I will invite you to visit Island City Mall located at Dao Tagbilaran City. Island City Mall is good place to shop with and get everything you wish for! You what are you thinking of?, pay to visit Island City Mall. Read all 45 comments by readers. your comments on "Punta Cruz Watch Tower"